The Bureau of Alcohol, Tobacco and Firearms has adopted a pay banding system to boost its efforts to recruit and retain high-caliber information technology employees, an ATF official said. The Treasury Demonstration Project for Designated Critical Positions has a more flexible payment schedule for certain employees in critical scientific, technical and engineering positions. ATF's pay banding system combines the federal government's 15 General Schedule pay structure to create four broader salary ranges or pay bands: entry and developmental, full performance level, senior level, and expert and manager level. The bureau will increase pay bands by the same amount as federal general schedule hikes. Enrollment in the project is optional for ATF's 260 eligible employees. Eighty-seven percent of them have enrolled, Schambach said. 'That says a lot about how attractive this program is,' he added. In fiscal 1999 appropriations legislation, Congress granted ATF, the Customs Service and the Secret Service three-year authority to launch the pay performance management system for 950 scientific, technical, engineering, intelligence analysis, language translation and medical jobs. The FBI had received the same authorization in fiscal 1998, which provided an impetus for ATF, Schambach said. 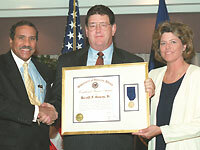 Former Veterans Affairs CIO Harold Gracey, center, is joined by wife Donna as he gets an Exceptional Service Award recently from VA Secretary Togo D. West Jr. Gracey left VA for the private sector after a 30-year federal career. 'It was a direct reaction to the FBI getting the authority,' Schambach said. The two law enforcement agencies compete head to head, not only with the private sector, for employees with the same technical expertise, he said. Under the project, ATF also has implemented a pay-for-performance policy in which employees advance on the pay scale according to performance and skill, Schambach said. The policy emphasizes accountability to organizational goals and meeting critical job elements and performance standards. The performance rating equates to percentage increases in base pay, and outstanding work makes employees eligible for bonuses. ATF employees enrolled in the pay demonstration project may be eligible for paid sabbaticals and self-directed studies. The program lets ATF accelerate qualified employees up through GS 15 without appointing them to management positions. Previously, employees moved up the pay scale automatically unless poor performance was recorded. 'Now they are not entitled to anything unless they perform well,' Schambach said. ATF recently released vacancy announcements for positions reflecting the new pay-banded salaries. By the end of the summer, Schambach said, he will better understand the new method's effectiveness. Employees on the verge of retirement have delayed their departures because of the incentives the new program provides, he said.